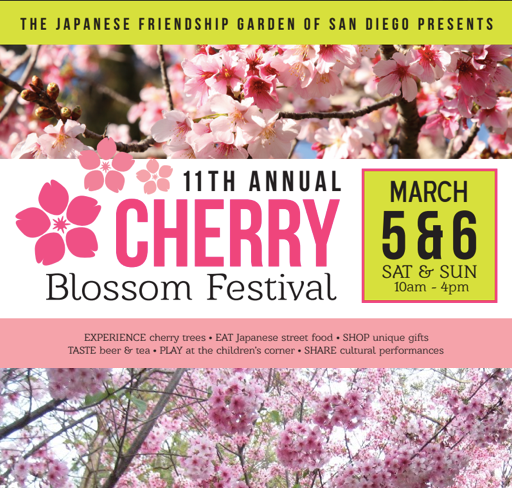 The annual Cherry Blossom Festival at the Japanese Friendship Garden returns for its eleventh year on Saturday, March 5 & Sunday, March 6, combining both cultural education with family fun, all packed into one great weekend! Because we love our readers so darn much, we are raffling off 2 single day tickets to attend. Read on and be sure to enter! At this year's Cherry Blossom Festival, in addition to over forty beautiful cherry trees, there will also be live entertainment and surprises for all ages. There will be a children's area that will feature a blow up obstacle course, as well as treats and crafts. For the adults there will be a beer and tea garden featuring brews and blends from all around San Diego. There will also be live performances all weekend and excellent cuisine choices to give everyone a taste of Japan. Guests may want to grab a bite and partake in Hanami, the traditional custom of picnicking under the cherry trees. For more information on this year's Cherry Blossom Festival and to purchase tickets, visit niwa.org/11th-annual-cherry-blossom-festival.